We have been fortunate to have the world finals for the student competition FIRST Robotics here the last several years, and I always try to spend some time wandering around, talking to the kids and the adults. This year I got to volunteer for a day, which was wonderful, even though my task was fairly mundane. I spent some time talking to the folks from NASAtv who broadcast up to six different channels of programming during the event. These guys are amazing in how much they know about the various technologies to pull off broadcasting in harsh conditions. 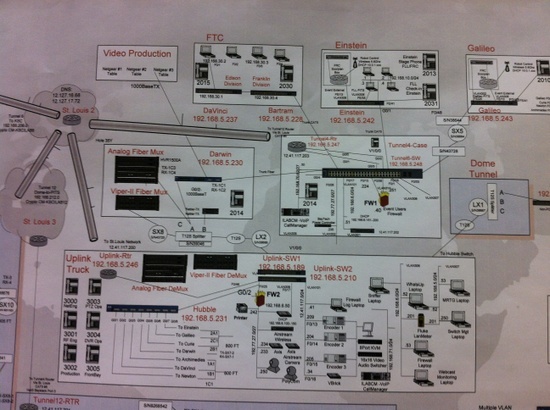 You might not think that having a TV truck in the middle of what usually is a football stadium is hard, but consider that they have to set up their own control room on what is usually the 35 yard line, and with a network topology shown above that has to be assembled in a matter of a few days. All of the competitions make use of wireless technology that is carefully tuned to ensure that each bot has a clear channel to its controllers and can only play on a particular field. I took some pictures of the participants and their bots. One thing that I didn’t really grasp until this week was the wide range of equipment that the teams bring with them: the smaller kids in the Lego league mostly had fun decorating their pit stop areas, while the bigger bots (that can weigh more than 100 lbs.) bring in an entire machine shop as they have major surgery and last minute repairs to perform. Of course, there were fun costumes, hairdos, and other wild add-ons for the human participants. Here is a Pinterest gallery of my photos. And here you can find a video that I shot two years ago.